This event took place on February 1. 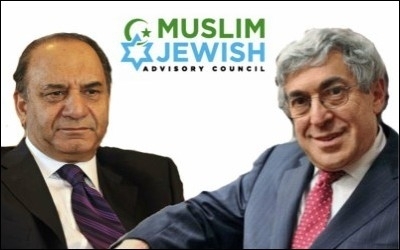 MJAC co-chairs Farooq Kathwari and Stanley Bergman. This evening, the Washington policy debate over radical Islam is promised a fresh interfaith effort. In the Dirksen Senate Office Building, beginning at 6 p.m., Sens. Orrin Hatch (R-Utah) and Ben Cardin (D-Md) will cohost a reception honoring a new "Muslim Jewish Advisory Council" (MJAC). The Council was formed in November by representatives of the American Jewish Committee (AJC), the country's premier Jewish leadership group, and the Islamic Society of North America (ISNA). ISNA has been exposed as a channel for spreading Saudi-based Wahhabi fanaticism in U.S. mosques. The ISNA co-chair of the MJAC is an Indo-American Muslim named Farooq Kathwari, who hails from Kashmir, divided between India and Pakistan. Kathwari is the CEO of furniture maker Ethan Allen Interiors. His son Irfan, only 19, was killed while fighting in Afghanistan, according to Farooq's brother Rafiq Kathwari, and this apparent "martyrdom" was memorialized when Farooq Kathwari endowed a foundation named for his son. In 2006, the Irfan Kathwari Foundation contributed $100,000 over three years, in partnership with the Clinton Foundation, to a program for refugee aid. Farooq Kathwari was appointed by Obama in 2010 to the President's Advisory Commission on Asian Americans and Pacific Islanders. Their opening to ISNA and Kathwari did not earn the American Jewish Committee much in the way of Islamic appreciation. Hatem Bazian, a lecturer in Near Eastern studies at the University of California, Berkeley and among the most strident Israelophobes in America, became the designated laptop hitman for the aggrieved Muslims, many in the ranks of ISNA, who see "Islamophobia" as their only challenge. According to Islamists, Jews must grovel before engaging in interfaith dialogue with Muslims. On his website, Bazian ranted against the AJC for allegedly fostering anti-Muslim bias, demanding peremptorily that AJC "fundamentally change its character" by "rescind[ing] and withdraw[ing]" its past hospitality to critics of Islamic extremism as diverse as Salman Rushdie, Daniel Pipes, and Ayaan Hirsi Ali. According to Islamist demagogues like Bazian, before the Jewish leaders may be accepted in a dialogue with the Muslims, they must grovel. Jewish activists tempted by visions of easy cooperation with official-sounding Muslim groups should be wary.